I dream up a my own strawberry cheesecake version. And I did it.. I am so proud, it is certainly worth the effort. My family really love it. It`s so creamy, moist and tasty. After Strawberry Spinach Salad I decided to make a new one strawberries creation. 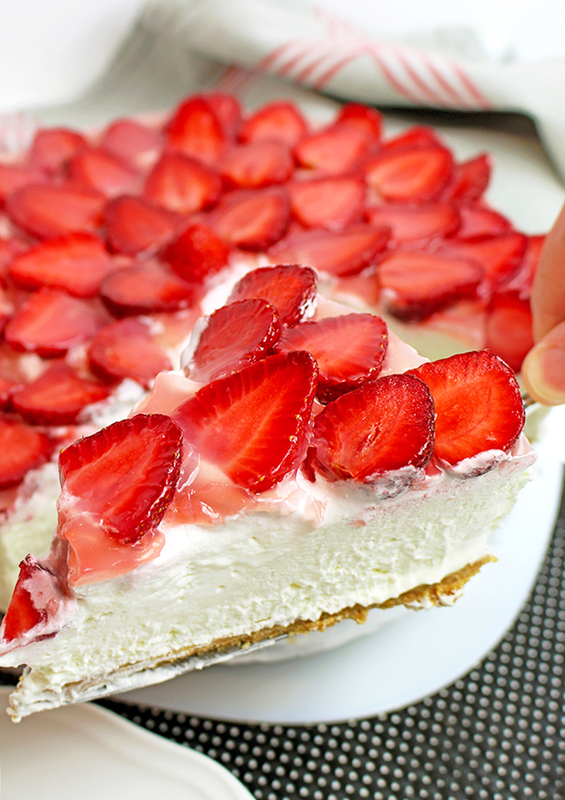 Strawberry cheesecake is delicious and sweet.. With a perfect amount of sweetness. Lightweight cake rich with healthy strawberries ? Take a quick look to our dessert creations with strawberries Easy Homemade Strawberry Ice Cream, Fresh Strawberry Cream Cheese Cake and Strawberry Blueberry Icebox Cake. If you want a simple dessert for a busy schedule, look for a no bake strawberry cheesecake with lemon juice flavors. 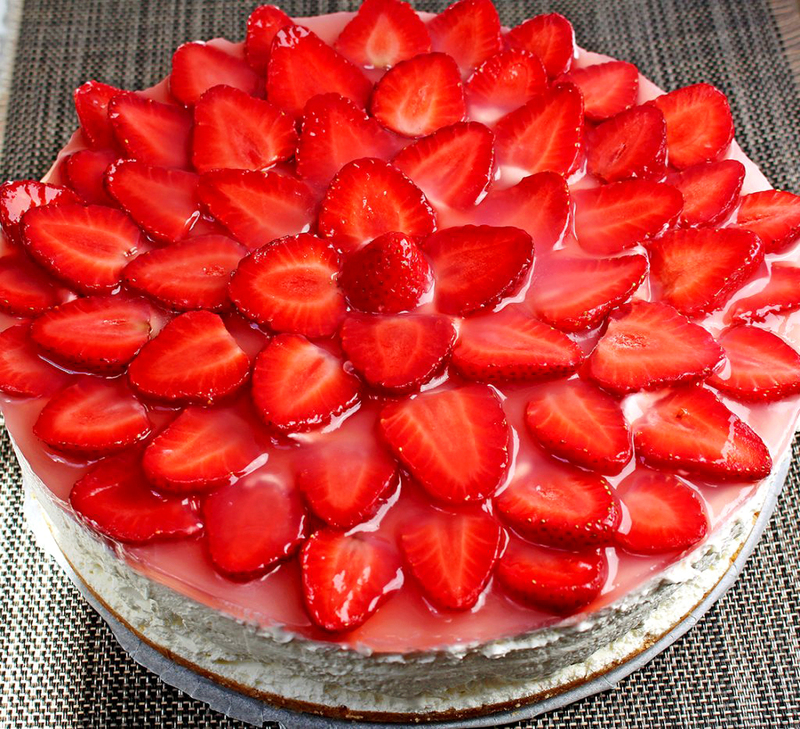 Easy festive dessert for any special ocassions.. guests will surely countdown the minutes until they can jump into this very strawberry cheesecake.. This is a amazing dessert which always get better after 1 or 2 days in the fridge. Spring is the most beautiful season, for me. Everything in nature is waking up from long winter sleep. Sun rays give us energy and make us feel better. What make spring special are strawberries. It`s so simple to make yet so delicious to taste. It’s not overly sweet and cheesecake that hasn’t been baked generally is not as firm as baked Cheesecake so you can not expect a lot of the consistency. 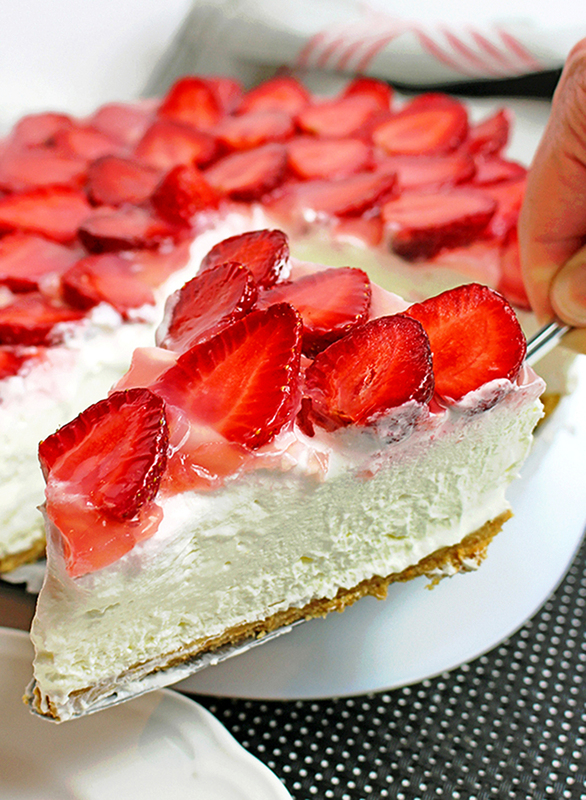 No Bake Strawberry Cheesecake recipe is a perfect homemade dessert rich with graham cracker crust, cream cheese, lemon juice and fresh & juicy strawberries. Put parchment paper in the cake tin and leave aside. GRAHAM CRACKERS CRUST - Put graham crackers in the food processor and crumble them. Combine graham cracker crumbs, sugar and butter in a medium bowl. Spread the mixture evenly in the cake tin and shape using hands. Leave it in the fridge, while you prepare cheesecake filling. CHEESECAKE FILLING - In a large dish whisk heavy cream with an electric mixer using medium speed, for about 4 minutes. Then, whisk for about a minute at a maximum speed. In a separate medium dish, mix cream cheese, powdered sugar and lemon juice with an electric mixer at a medium speed for about a minute. Put it in the bowl with heavy cream and mix briefly, until well combined. Take the cake tin out of fridge and spread cheesecake filling evenly over graham crust layer. 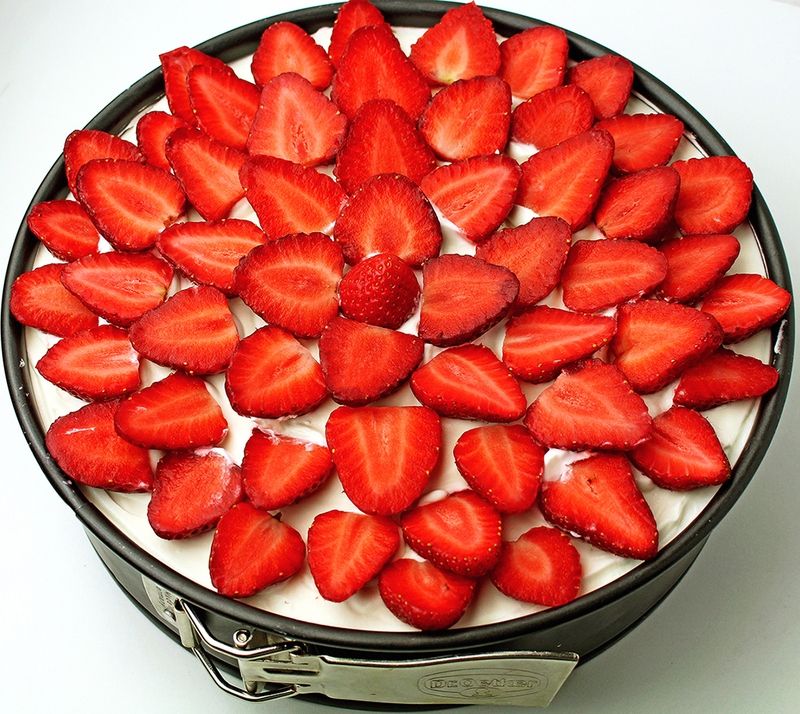 TOP OF CAKE - Cut strawberries in half or slice them and place over the whipping cream. Put the cake tin back to the fridge. SAUCE - Boil some water in a medium sized pan, using moderate heat. Mix cornstarch and sugar and put them into boiling water. Add lemon juice and cook on moderate heat until it thickens. Remove from heat. You can add a few drops of red food color, if you wish. Leave to cool at a room temperature and put over the strawberries. Leave it in the fridge for at least 4 hours, possibly overnight. Thank you for sharing the recipe. I made it and mywhole family liked it as it’s not overly sweet, however my cream filling is not of the consistency as the baked cheesecake even when I left it overnight in the refrigerator to set. Was it supposed to be like that? Yes, since Cheesecake that hasn’t been baked generally is not as firm as baked Cheesecake.